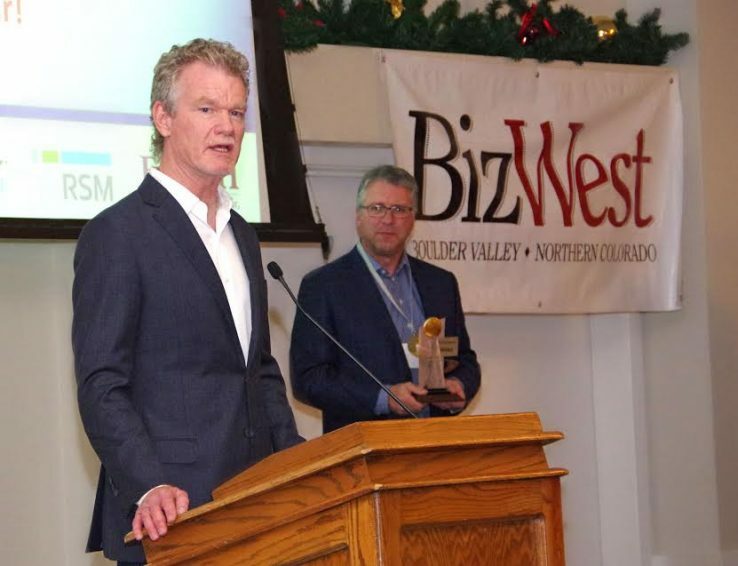 LONGMONT — Dave DuPont, co-founder and chief executive of Boulder-based TeamSnap Inc., was named Innovator of the Year at the 2016 IQ Awards and Innovation Summit presented Tuesday evening by BizWest Media at the Plaza Convention Center in Longmont. Boulder-based Biodesix Inc. was named Innovative Company of the Year, and Fort Collins-based nonprofit Innosphere was selected as the Incubator/Accelerator of the Year. Six companies won IQ Awards for innovative products in their respective industries. Started in 2000, the IQ Awards honors the “Innovation Quotient” among companies and organizations based in Boulder, Broomfield, Larimer and Weld counties, as well as local divisions of national/international companies that have been instrumental in developing the most innovative products and services. Dupont co-founded TeamSnap in 2009 to provide Web and mobile-app based systems for members of sports teams to communicate with each other. As the company’s chief executive, DuPont grew the tech firm from four to 75 employees, raised more than $22 million in investor funding and built its customer base to 10 million. By embracing technological advances, Dupont and co-founder Andrew Berkowitz were able to expand product offerings to serve clubs, leagues and associations as well as teams, allowing TeamSnap to emerge as a dominant sports communication and management platform. Dupont developed a culture of innovation, letting staffers work from where they wanted to. “About 20 percent of our staff works in our Boulder office, the rest are elsewhere, many in RVs traveling the country,” Dupont told the crowd attending the event. Dupont also made a point of letting employees set their work hours, and brought people back into the workforce, mainly women who had taken time off to raise families. While early times were lean, DuPont funded initial salaries from his own pocket, and went without compensation himself for almost a year. Kristy Lewis, CEO of Quinn Foods in Boulder, and Joel Oakman, director of engineering at Vairex Air Systems in Boulder, were Innovator of the Year finalists. Biodesix Inc., founded in 2005 and led by CEO David Brunel, is a pioneer in blood-based molecular diagnostic testing. The company’s liquid biopsy tests are used to help physicians select treatment for patients with advanced cancer. Unlike traditional tissue-based testing, these tests can be performed with a simple blood draw, instead of invasive surgery, and results are available within 72 hours. Madwire in Fort Collins and n.io in Broomfield were Innovative Company of the Year finalists. Innosphere in Fort Collins is a science and tech incubator that since its launch in 1999 has recorded a 75 percent success rate among client companies. Led by CEO Mike Freeman, Innosphere provides mentorship to companies in the industries of health innovations, life sciences, software, hardware, energy and advanced materials. Innosphere’s incubation program focuses on ensuring companies are investor ready, connecting them with experienced advisers, and making introductions to corporate partners. Once accepted into the program, companies receive customized development plans and ongoing support to ensure they’re getting the know-how to raise the right kind of capital, and all the resources to grow. Mergelane In Boulder and UpRamp in Louisville were Incubator/Accelerator of the Year finalists. Prieto Battery, Fort Collins: The company is developing a patented 3-D lithium-ion battery technology that delivers transformational performance at a competitive cost using nontoxic materials with the ability to customize shapes. Clean Energy Collective, Louisville: CEC has developed a comprehensive software-as-a-service platform that provides utilities with a turn-key community solar solution to successfully launch and monetize their own projects. With the “teach-them-to-fish” approach, CEC is dramatically changing the trajectory of solar adoption. New Sky Energy, Boulder: Renewable natural gas (biogas) is frequently contaminated with hydrogen sulfide (H2S), a deadly gas that must be removed before the gas is sold or used. New Sky’s SulfurCycle process is a sustainable method of sweetening such H2S-contaminated gas that is much less costly than competing technologies. QuadshoX, Fort Collins: This startup has designed an innovative rear suspension retro-fit kit for tilt-in-space manual wheelchairs that significantly reduces the shock felt by the user when rolling over rough and uneven surfaces. While power wheelchairs have suspension, manual chairs do not, and the slightest bump or uneven surface sends very painful shockwaves to the wheelchair rider. Asius Technologies, Boulder: Asius develops audio technology that employs a patented second eardrum which absorbs the harmful pressures that cause hearing loss and degrade sound quality. Asius’ products are enjoyed the world over by sound engineers, musicians, audiophiles, and anyone who wears ear devices for sustained periods in loud environments. Silvernest, Boulder: Silvernest is a highly scalable, innovative online solution that airs aging homeowners (50+) with compatible roommates and provides tools for long-term home sharing. mcSquares, Broomfield: Makes collaborative dry-erase tiles that can come off the wall and be handed around the room to get people to contribute and then snapped back on the wall so all ideas can be discussed in front of the group. A wirelessly connected version is also in the works. Acroname, Boulder: Programmable 8-port USB 3.0 Hub that allows engineers complete software control of USB functions for manufacturing and lab environments. Stratom, Boulder: The eXpeditionary Robo-Platform (XR-P) is an unmanned system that autonomously loads and unloads pallets from multiple aircraft types, eliminating currently required material handling equipment and reducing manpower requirements. The system aims to revolutionize aircraft cargo management by introducing advanced technologies to aircraft cargo handling processes while significantly reducing manpower and loading time. Eximis Surgical, Fort Collins: Developing a minimally invasive surgery device for the removal of large specimens through small incisions. The company has developed a fully contained device that allows surgeons to quickly and easily remove large specimens, eliminating the need to enlarge incisions and reducing the likelihood of post-operative complications. Green Sun Medical, Fort Collins: Developing innovative spinal bracing technology for the treatment of deformities, including scoliosis and kyphosis. Their dynamic brace technology will offer new hope to patients facing invasive spinal corrective surgery. High Precision Devices, Boulder: HPD’s MRI standards enable a new field called quantitative MRI. qMRI is a noninvasive disease diagnostic that improves patient outcomes and reduce health-care costs. Developing calibration standards for medical imaging, and particularly, MRI, aims to accelerate diagnostic performance, throughput and reliability of quantitative medicine. Sospes, Boulder: Sospes developed intuitive web and mobile software that allows workers to report workplace incidents, close calls and make suggestions in real-time. Provides mobile incident reporting with voice capture and photo capability. The Supervisor Portal allows management to complete incident reports, open investigations and automatically generates regulatory reports. 3PHealth, Boulder: The company’s contextual data communication platform enables digital care delivery strategies that provide an individualized, unified experience, that leads to greater health system utilization efficiencies, patient-provider engagement, and accountability all in support of better health outcomes and bottom lines. Techtionary, Boulder: MedsMinders is an iPhone/iPad app to help/aid users and caregivers in managing their medications, therapy, diets, drugs, etc. to provide reminders and alerts for users, patients, therapist, pharmacists, practitioners, family members, caregivers and other health-aid helpers to reduce side effects, disease, effects, injury, impact, emergencies, trauma and other impacts. CaliberMind, Boulder: CaliberMind analyzes human language and behavior from CRM emails, recorded sales conversations, marketing automation data as well as from social networks to uncover B2B buyer needs, motivations, personality and even decision making style. It then recommends communication, and subscribe content that accelerates B2B deals. Bear Systems, Boulder: Bear Systems has designed an elegant solution to manage and secure Internet of Things /Edge devices. Using remote management, users can securely initialize and manage these specialized devices, and protect them from becoming an entrance point to the larger network. EnergyLogic, Berthoud: Housing Tides Report is a comprehensive monthly report on the US Housing sector. It is a combination of forecasts, media analysis, forecast analysis and a comprehensive index of the health of the top forty-one US housing markets. Tides uses a combination of statistical analysis and machine learning to derive results.